What a week or two it has been! The ‘silly season’ has kicked off with a bang – the weather has been hot – too hot for me – the traffic has doubled and just when I was feeling quite smug because I had everything in hand YD decided she was going to create an Outdoor Entertainment Area [note the capitalisation folks] and I was designated the position of chief adviser and consultant. 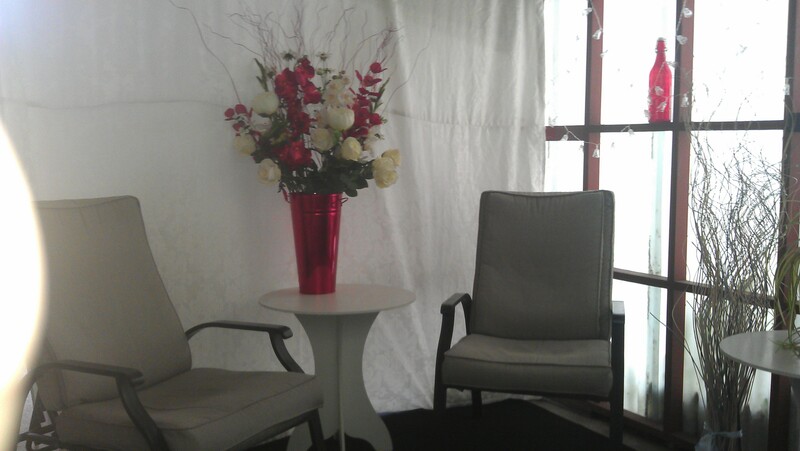 The down-side of having an unexpectedly Good Idea for an event that is alarmingly close is there is no budget for it. There are other Good Ideas that were thought of a reasonable amount of time prior to the coming event and all spare monies have been allocated to them. The event in question is something that occurs two days before Christmas and is down purely to very poor planning on my part, more years ago than any one cares to mention now. A plan had already been hatched for this momentous event, for the first time in over four years my daughters and I are having a girls weekend away. [The last one was the celebration of my 60th and we went to Melbourne for 10 days – that was the most fabulous holiday of my life!] This time we are staying quite close to home. We are off to Queenstown [the stunningly beautiful tourist capital of New Zealand] for three days to stay in a posh hotel, undertake a few of the more sedate adventures on offer and to over indulge in good food and wine. So, you may well understand how the latest Good Idea, whilst a very good Good Idea, raises a few issues around budget. How do you turn a three-quarter enclosed carport into a stunning outdoor entertainment area in double quick time and with very little money? YD had four days off in which to accomplish her Good Idea and my promotion was intended to ensure that she achieved her aim. The lofty elevation in my status therefore involved three days of investigating what we might possibly get for as close to $0 as possible for lighting, covering the floor, how best to enclose the car-port that is being utilised for said Outdoor Entertainment Area – also for nothing – and the most cost efficient manner in which to decorate the enclosed space. The starting place was lighting. YD wanted to get some solar powered Christmas lights and we trekked around all the stores being shocked silly at the prices – then we happened upon Bunnings. Bunnings had just the best and cheapest array of lights imaginable. 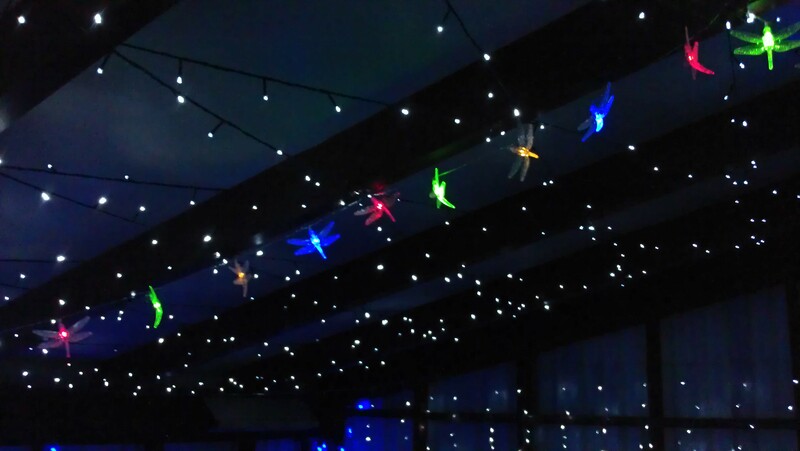 We got all kinds of lights, multi colours and white, balls, drops, dragonflies and stars and….. Closing of all or part of the front of the carport became a big issue, we trekked, we talked, we thought, we debated – but everything cost dollars that we did not have. Creative thinking to the rescue and a hunt through my fabric storage cupboard found a solution. A huge piece of white cretonne once used as a couch cover was the perfect size for a fabric ‘wall’. Flooring was the next issue – outdoor carpets, plastic grass [yech!] We considered fencing panels, laying them down would certainly be easy, but not that pleasant on the feet. We trekked and searched second hand shops for carpet off-cuts, old floor rugs – but there was nothing that we could even consider. We were down to wondering could we get cardboard boxes, open them flat out, paint them and tape them down. It seemed like a lot of work for something that would attract damp should it rain and become a home for a myriad insects and spiders over the course of the summer. Then we stumbled purely by accident on the Barbeque Mats. Designed to stop the barbeque splattering and dripping fats over your lovely wooden deck and staining it – soft, latex backed and a nice big size. Less than $10 each. 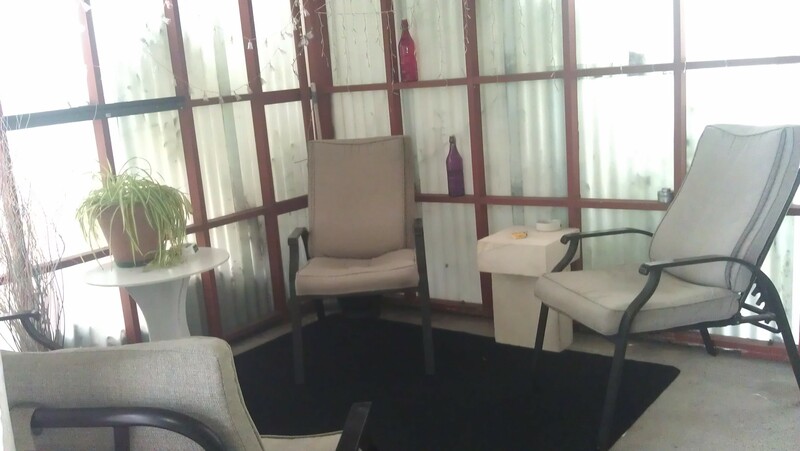 We purchased three with looks of triumph and raced back to the Outdoor Entertainment Area – Huzzah! Perfect fit. The latex grips the concrete and won’t move. We taped the three mats together with duct tape to keep them tight and the floor was done. A couple of tables were swiped borrowed from my place, my spare art table has been called from retirement to became a side board and various plants, sundry paintings [all done by the clever YD], ornamental bits and bobs have been re-located to add beauty to the Outdoor Entertainment Area par excellance! At this point in the post I was supposed to have a roll of photos showing before and after – but somehow that plan went awry and it appears a whole run of photos have gotten lost somewhere – there are only these which may give a bit of a hint, but nothing of the stunning ambiance….. This is the early set up phase, YD has begun to hang the lights, moved a side table in and a pot plant…… look at that floor! I’ll post some photos later of the stunning Outdoor Entertainment Area when it is in full use. 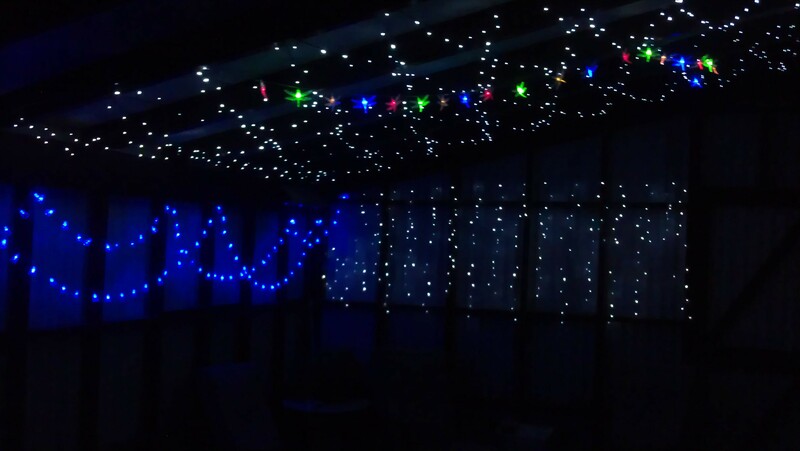 This entry was posted in Daily Life and tagged Bunnings Warehouse, Christmas, Christmas Light, making a Christmas room, Melbourne, outdoor entertainment area by thecontentedcrafter. Bookmark the permalink. Those are great plans!!! love having time to spend with the family. Enjoy your time with your daughter. The place looks fabulous. I love the lights! Working outdoors is my favorite thing as well, but the heat does not let me either. However, it has been nice these couple of days. 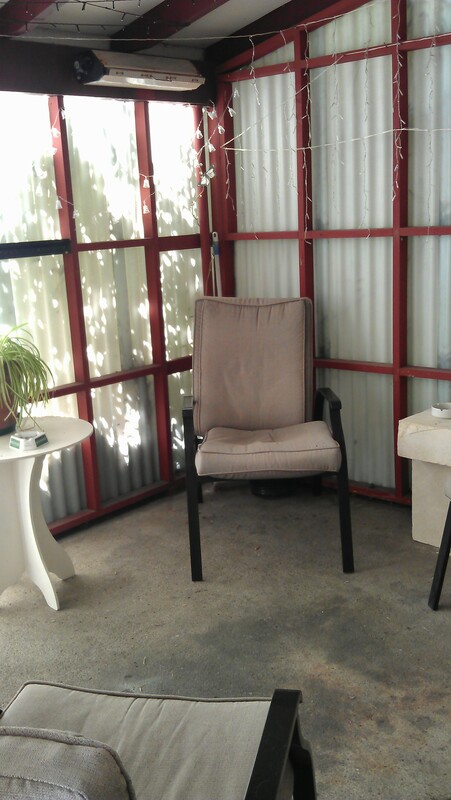 You will have your lovely ‘new’ apartment to celebrate in and we have our lovely outdoor room – aren’t we fortunate!! Much love to you too dear Pati – and to Robert too, tell him from me, good decision, good job and well done! I love the outdoors, and I love entertainment, so I’m sure I’d be quite happy camped out in this lovely area!. Great post! i think it is BEAUTIFUL! I agree with all the comments above, the best spaces are made with your own imagination and things you have from around the house. Giving them new life:-) That is why I never look at “house beautiful” magazines….I like spaces that are made from the heart and tweaked with a little imagination, and from a YD heart is the best! Thank you Robbie – I think you are absolutely right too! Well, it’s all been said above, but still . . . I love this sort of decorating! And you might think it was poor planning originally (some time back, I think . . .), but look at it this way; you will always have a gorgeous area ready for Christmas entertaining / partying. Love the lighting, especially. I like fabric for closing off one side of the carport, too. If it blows about, try tying pebbles in along the hem. Let me know if you want suggestions on that; I have an easy way to do it. The bottles are a nice touch, too; no-one will notice when they are emptied . . . and you can add more as you like . . .
Ha! Yes, all points of the globe laying down in unison – or like a reversed mexican wave – to view our party antics!! I’m on high alert to get everything completed and ready for Friday! Time is racing past now…. I love this story. It’s wonderful to read about the connection with your daughters, the plans you’ve put in place, both for travel and holiday celebrating. Happy birthday to YD. I just added another layer of clothing, so I’m smiling to think of you basking in the heat. It’s easy to create something fabulous with loads of money. It’s often far more interesting and creative to do what you’ve done: make it work with things you beg, borrow and ‘steal’ if only for awhile. It looks cozy and quaint. LOL! Well if your photos are unpublishable, it means you’ve really had a wild time. Enjoy every minute of it. I was on some site the other day where she used vintage bed sheets to make bunting (hanging banner of triangles). I think that might be a fun, free party-ish thingy. If one didn’t have cute vintage sheets, they’re usually way cheep at 2nd hand or Goodwill stores. It’s so funny for a northerner to hear “warm summer Christmas nights”, LOL 😀 My brain just goes, “wait….what? ?” LOL, Cheers to drinks in the Cabana! Birthday greetings to YD! I love the transformation:) Enjoy! I’ve just finished reading and commenting on your post – lovely to ‘see’ you again 🙂 Thank you and I shall pass on your greetings! Oh Wow Pauline, it looks fabulous, you are so wonderfully creative! Have a great trip away and I’m sending best wishes for YD’s birthday, I think it’s going to rock! And lady, you are looking good for over 60!! Thanks Hon – I am looking to have a fun time, both home and away!! And you are very sweet – I’m learning that age is only a number and how you see yourself is way more important 🙂 I’m younger now than I was ten years ago. Yep, age is a funny thing. My kids are older than I feel I am lol. It’s quite a shock sometimes when I look in the mirror though! Oh gurgles of joy …… guffaws and hiccups of laughter …… we nailed the brief and made it our biotch!! YD will be doing her happy dance at this one!! Literally the ground floor – hiccup – riding the wave …. ………and it’s raining here this morning! I jinxed it! !